KOKOMO, Ind. – From the day he first touched a basketball, James Rayl only knew how to do one thing – score points. From local parks to Memorial Gym, from the Indiana Hoosiers to the Indiana Pacers, Rayl scored buckets by the dozens and became known as one of the best shooters to ever play the game. He was a legend, both in Kokomo and around Indiana. On Sunday, at the age of 77, James “Jimmy” Rayl quietly passed away at his Kokomo home. In recent years, Rayl had struggled with several health issues – a stroke and open heart surgery in 2011 slowed the 6-foot-2 sharpshooter. Then during the latter part of 2018, his kidney’s started to fail and he was placed in a rehabilitation hospital. He returned home earlier this month. 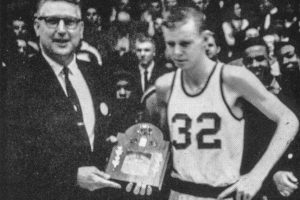 Known as the Splendid Splinter, he helped lead the Kokomo Wildkats to the IHSAA Final Four during his senior season of 1958-1959. Averaging 29.6 points per game, the Wildkats finished 23-6. They won sectional, regional and semi-state titles before defeating New Albany 58-56 in the state semifinals. Rayl’s season ended in the state finals, where Crispus Attucks knocked off the Kats 92-54 – but not before Rayl set a state Final Four record with 114 points. He finished his high school career with a then Kokomo record 1,632 career points and was the first member of the 1,000 Point Club. He scored a staggering 858 points his senior year while setting the North Central Conference mark with 269 points. Following the state finals, he earned the IHSAA Trester Mental Attitude Award, was named Indiana Mr. Basketball and earned the title of Star of Stars at the Indiana-Kentucky All-Star Series. His talents landed him in Bloomington, where he again scorched most nets he shot at. After sitting out his freshman year (frosh were ineligible in those days), he got his feet wet as a sophomore and returned to form as a junior, where he averaged 29.8 points per game to earn All-Big Ten and third team All-American honors. As a senior, he averaged 25.3 points per game and earned the same Big Ten and All-American honors. Amazingly, he still owns the single-game scoring record for the Hoosiers – a feat he accomplished twice. He scored 56 points in a game against Minnesota in 1962 and then did it again in 1963 against Michigan State. He ranks 23rd on the school’s all-time scoring list with 1,401 points and he shot 41.6 percent from the floor and 83.5 percent from the line in 68 games as a Hoosier. Rayl was drafted by the Cincinnati Royals in the third-round of the 1963 draft but signed with the Indiana Pacers. He played in 101 games for the Pacers from 1967-1969, where he averaged 11.1 points. He averaged 12.0 points his first season and 8.9 the following year. In what many still consider a travesty, Rayl was cut by the Pacers after 27 games; he never played professionally again. During his career he also played on the 1966 World Cup championship squad and was a member of Goodyear’s AAU national championship squad. Rayl eventually returned to Kokomo where he worked for Xerox. He married Nancy and they had four children. His prolific career landed Rayl in the Indiana Basketball Hall of Fame in 1989, the IU Athletics Hall of Fame in 1991 and as a charter member of the Howard County Sports Hall of Fame in 2003. NOTE: Funeral arrangements were still pending at press time; the Sports Journal will post details on its website (www.indianasportsjournal.com) and Twitter page (@Sports_Journal). This entry was posted in Basketball, IHSAA, indiana All-Stars, Kokomo, Uncategorized. Bookmark the permalink.